SAP Business ByDesign provides small and medium enterprises with a cloud-based enterprise management system, including solutions for Customer Relationship Management (CRM), Finance, Human Resources (HR), Procurement, Project Management, and Supply Chain Management (SCM). With the next openSAP course on SAP Business ByDesign, we will focus on SAP Business ByDesign Financials, where you’ll learn about the financial solutions available with SAP Business ByDesign. SAP Business ByDesign Financials will begin with an introduction to SAP Business ByDesign and from week 2, you will have the opportunity to see a variety of tasks performed in an end to end process. Starting with Goods and Services Value Chain, you’ll see the capabilities involved in selling and purchasing a product, as well as project and production execution. Moving on to week 3, you’ll see the day in the life of an Accounts Receivable Clerk and Accounts Payable Clerk, reimbursing travel expenses, reporting VAT returns, processing bank statements, monitoring cash and liquidity, and many more day to day tasks that you can easily undertake with SAP Business ByDesign. The knowledge from this course is helpful for SAP Business ByDesign implementation projects. This course is aimed at SAP Business ByDesign Partners and Consultants as well as key users, auditors, and end users. 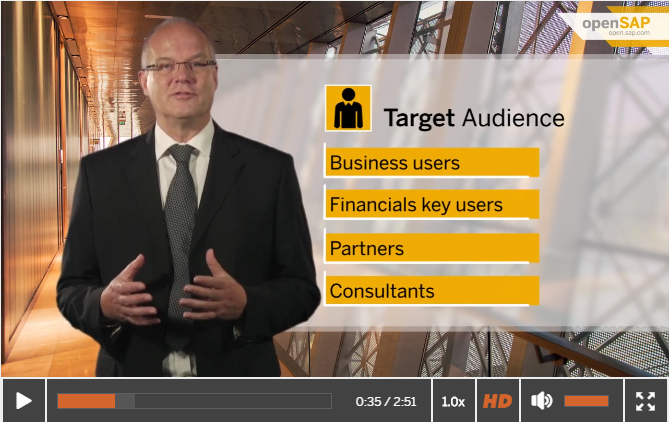 SAP Business ByDesign Financials starts from March 1 and will run over a 5 week period. Enrollment is open to everyone interested in learning more and all you need to sign up is a valid email address! Is there any complete certification available for SAP Business ByDesign – Financials?